Since I can remember, New Year’s Day has called for beef. Whether it’s a steak with roasted veggies, some homemade chili con carne with jacket potatoes, or a traditional steak pie, the first of the year calls for some yummy beef. This year I decided to make something a little different. With Matthew out of town for a couple of days I was dining solo, so I wanted to make something simple and tasty which would also freeze / keep and reheat beautifully. 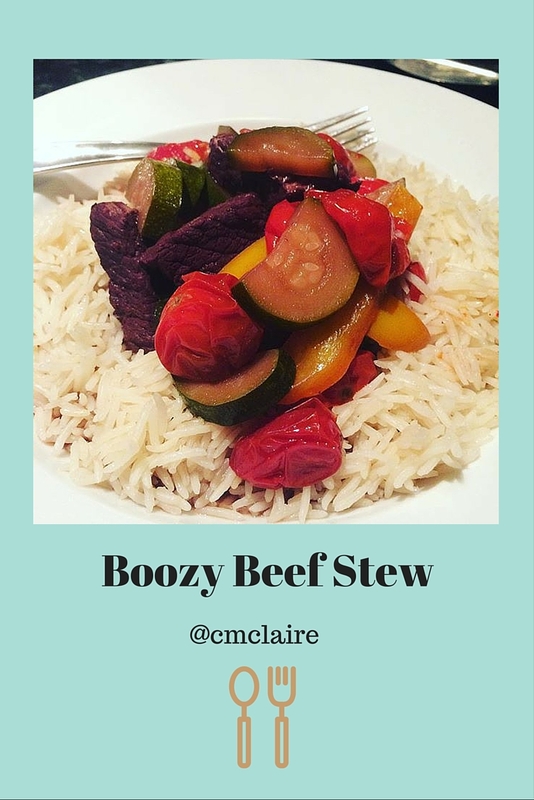 What I came up with was this boozy beef stew, which makes four generous portions – one for me to enjoy on New Year’s Day, and three for Shona, Matthew and I to have with mashed potatoes a couple of days later. Serve with a carb or vegetable of your choice! This recipe takes about 2 and a half hours from start to finish, but is very low-key, the perfect recipe to do while you’re pottering around with other things. I used my lovely cream casserole dish from Asda that my Secret Santa selected – now a *steal* at £15. Great little bit of kit! With this and my little Staub pot, I’m a total convert to hob-to-oven-to-table cooking. So lovely at this time of year, and the kits love lazing in the vicinity of a warm oven…. 1. Pop your oven on to preheat at 150/160 C.
2. Put your casserole dish on the hob, and melt the butter over a medium heat. Add your cubed stewing beef. 3. Brown the meat for 3-5 minutes. While you are doing this, boil a little water in a kettle. 4. Once the meat has browned, add half of your wine, one stock cube, and enough water to cover the meat. Place the lid on your casserole and pop it into the oven. Set a timer for 80 minutes. 5. After 80 minutes, slice your courgettes and peppers. Take the casserole out of the oven, and add the sliced veggies to the mixture. Stir the mixture, and add the rest of the wine, a little more water* and the second stock cube. *This recipes uses a lot of liquid so you have plenty of gravy and to leave plenty of moisture if you’re reheating the dish as a leftover! 6. Add the cherry tomatoes to the top of the mixture, do not stir through. Replace lid and return the casserole to the oven for a further 60 minutes. 7. Depending on your accompaniment, timing your side dishes will work alongside the finish time for this dish. After the 60 minutes in step 6 you’ll be rewarded with tasty, succulent, slow-cooked beef, plenty of veggies, and a rich gravy. I will certainly be making this again – perfect January comfort food! Please do let me know if you try this recipe. Great call – the gravy is delish (slow cooked red wine is so yummy!). I saved some and had it over spinach and courgettes – lovely! This sounds SO GOOD. Conveniently, I have a bottle of Cabernet Sauvignon sitting around and I don't really drink red (although love it in food, weirdly). TOTALLY A SIGN that I need to make this!